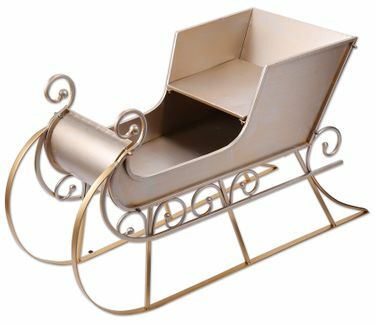 Dash through the snow and set a holiday mood with our lovely new 40" Gold Metal Sleigh! You will feel like you walked inside a Christmas song when you add this sleigh to your home or office decor. The scrolls and classic design will help you welcome the holiday season like nothing else. Perfect for decorating inside and outdoors, it can stand alone or be a part of a larger holiday display. Fill with ornaments, winter animals, or wrapped gifts, this Golden Sleigh is as beautiful as it is practical. Size: 40.25"L x 24"W x 16"H, Metal.